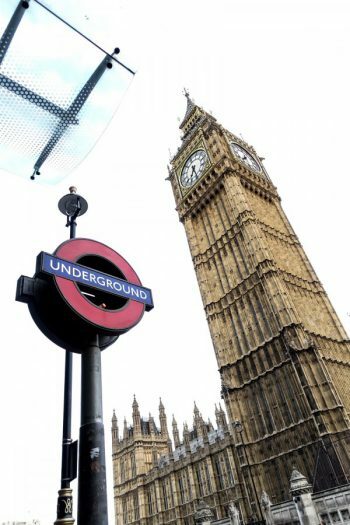 Those who follow me on Instagram might know, that I spent some days in London and guess what? I was super productive blog-wise. I met up with a couple of photographers to shoot some summer outfits for you guys. I also filmed a little bit so that I can share my London Looks Lookbook on Youtube as well. But before I start sharing these outfits, I want to share one more outfit I was wearing on a lovely day in Berlin. I’ve been wearing this kind of outfit quite often these past weeks, and you might have seen similar looks here on the blog. BUT they are all different. To show you how easy it is to create different outfits with the same or similar pieces of clothing, I am wearing them again and again, and I am only changing small details to create an entirely different outfit. Well, it is the first time I am showing this dress with you guys as I got it quite recently. But during Fashion Week I was wearing a similar white dress and this outfit would also work with the other white dress. White dresses are one of my go-to pieces in summer as they always look good, especially when your skin is tanned. The only downside is that white gets dirty pretty fast, but luckily I haven’t had any problems with it so far. I managed to stay clean when wearing a white dress or other white clothes haha. Everything you know about white t-shirts works as well for white dresses except that you don’t need a bottom to wear it with. 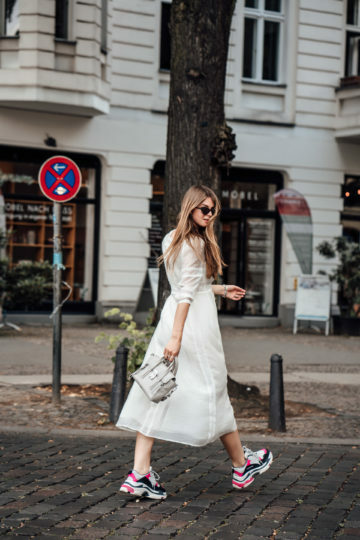 When wearing a white dress, all you need is a pair of shoes, a bag and some accessories such as a pair of sunglasses and some pieces of jewellery. I do love golden jewellery, but I got everything in silver. I think gold looks even better in combination with a white dress than silver does, so you definitely should at least give it a try. You will be surprised how easy it is to create a cute summer outfit with a white dress and some accessories only. Yep, I was wearing my Balenciaga Triple S sneakers again. I am sorry if you are already bored, but I just won’t get bored of them. Additionally, they make every single outfit look more interesting and add a sporty touch I like a lot. I especially love the combination of dresses, and ugly sneakers as this creates a cool contrast, that makes your outfit stand out. With a cool pair of ugly sneakers, you don’t need anything else to wear with your summer dress. Especially when they are a bit more colourful such as my Balenciaga sneakers here. That’s one of the reasons, why I wanted this colourway and not the white ones. Another reason was that I was afraid the white ones would get dirty too fast haha. Oh, and before I forget to mention it, you can combine every length of dresses, no matter if it is midi, maxi or mini, with ugly sneakers. What do you think about the combination of ugly sneakers and dresses?